Become a master thief and hoard loot in OrangePixel's arcade style platformer. 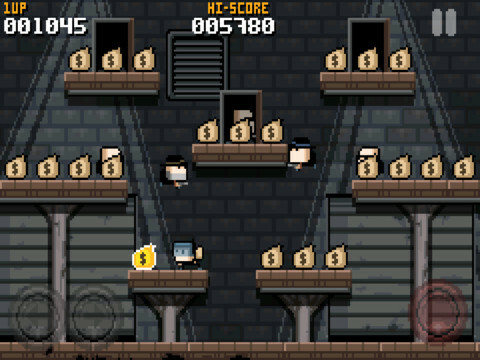 It's hard to dislike Chrono&Cash, the latest iOS and Android gem from developer OrangePixel. The concept is so delightfully simple and the gameplay so easy to get into that a few minutes quickly turn into 30 or more as you aim for the high score. There's still work to be done, and a few tweaks may improve the overall experience, but as it stands, you need this title pronto. Played holding the device horizontally or vertically, a subtle and welcome touch, the game presents you with a series of screens filled with platforms and treasure. You control master thief Cash, and must collect every bit of loot while avoiding enemies that appear from doorways scattered throughout the maps. Do so, and you move on to the next board. As expected, things begin easy enough, with only a couple bad guys to worry about. What's more, you always know when one of them is about to appear, thanks to a brief yellow exclamation point that appears over specific exits. That said, the difficulty ramps up quickly, as more enemies flood the screen and even random objects like boulders threaten to squash Cash flat. It only takes one hit to kill the little guy and you only have a certain number of lives, where losing them all kicks you right back to the beginning of the game. We love Chrono&Cash for its frantic platforming and excellent virtual controls. There's a huge adrenaline rush that comes from later stages, where we hop around like mad avoiding baddies while backtracking to snag a gem that suddenly appeared. Not only that, but in the OrangePixel tradition, retro graphics compliment this title, giving it that late 80s/early 90s look that screams NES or Sega Master System. The fact that you visit different environments through the course of the journey (a cave, Egyptian-inspired location) mean there's no shortage of cool pixel art to enjoy. As for the not so good bits, you can't access Game Center directly from within the app, which is something OrangePixel needs to fix. Beyond that, there's room to expand the game, perhaps with power-ups, weapons and the ability to restart from the current board. Bottom line, there's room for growth. Regardless of whether any of that happens, Chrono&Crash is a joy to play. It's both refreshingly easy to get into and visually-pleasing, making it yet another standout title from a talented mobile developer. Paying $1.99 may seem like a lot with so many games selling for $0.99, but considering the fun we've had, you should have no qualms spending the dough. What's Hot: Fast-paced and addictive loot grabbing, a variety of cool environments, slick pixel art, Facebook and Twitter integration, vertical and horizontal play support. What's Not: Cannot access Game Center from within the app, you always restart from the beginning.